With the proliferation of digital projection, the presentation of moving images in art galleries has exploded exponentially. In the process, the relationship of experimental film to the gallery circuit has shifted dramatically. This volume, coming out of Mike Hoolboom’s 2004 exhibition at the Art Gallery of York University, is a series of essays and conversations between artists, curators, and programmers that delineate the complicated path from the white cube to the black box. 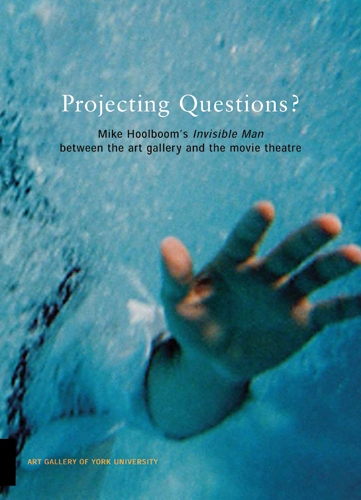 Mike Hoolboom has been called the finest fringe filmmaker of his generation. He has authored two books, Plague Years (1998), an anthology of his writings, and The Steve Machine (2008), a novel, and edited two books on fringe film practices, Inside the Pleasure Dome: Fringe Film in Canada (2000), and Practical Dreamers (2008). He has won over thirty international prizes and two lifetime achievement awards. He has also been the subject of nine retrospectives internationally. The Invisible Man was his first public gallery solo exhibition. Additional contributions from Philip Monk, Chris Kennedy, & Yann Beauvais. Designed by Lisa Kiss.